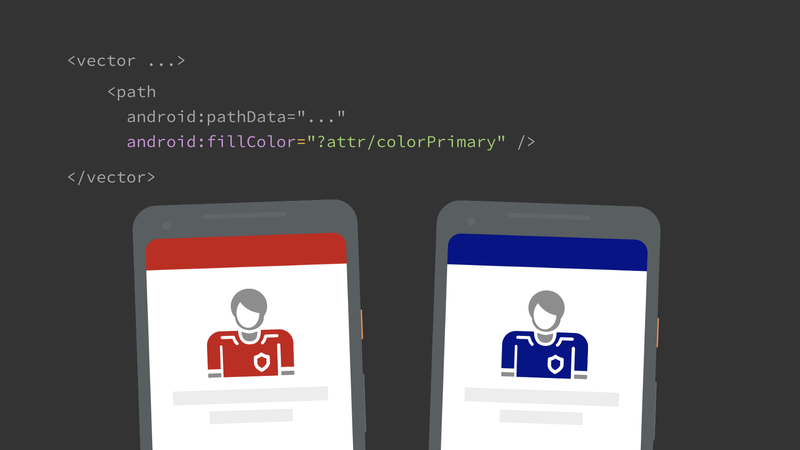 In the previous article, we looked at Android’s VectorDrawable format, going into its benefits and capabilities. We covered how you can define paths which make up the shapes in your assets. 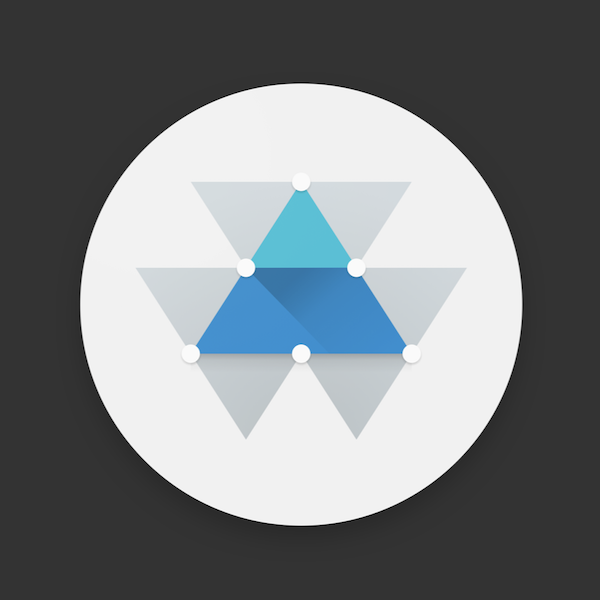 VectorDrawable supports a number of ways of actually drawing these shapes that we can use to create rich, flexible, theme-able and interactive assets. In this post I’ll deep dive on these techniques: using color resources, theme colors, color state lists and gradients. The simplest way to draw a path is to specify a hard-coded fill/stroke color. You can define one or both of these properties and only a single fill/stroke can be applied per path (unlike some graphics packages). Fills are drawn first, then any stroke is applied. Strokes are always centered (again unlike some graphics apps which allow inner or outer strokes), require a strokeWidth to be specified and can optionally define strokeLineCap, strokeLineJoin properties which control the shape of the ends/joins of stroked lines (also strokeMiterLimit for miter line joins). Dashed strokes are not supported. Both fills and strokes offer separate alpha properties: fillAlpha and strokeAlpha [0–1] both of which default to 1 i.e. fully opaque. If you specify a fillColor or strokeColor with an alpha component then these two values are combined. For example if you specified a 50% transparent red fillColor (#80ff0000) and a 0.5 fillAlpha then the result would be 25% transparent red. The separate alpha attributes make it easier to animate the opacity of a path. This allows you to factor out colors for easier maintenance and helps you to restrict your app to a consistent palette. 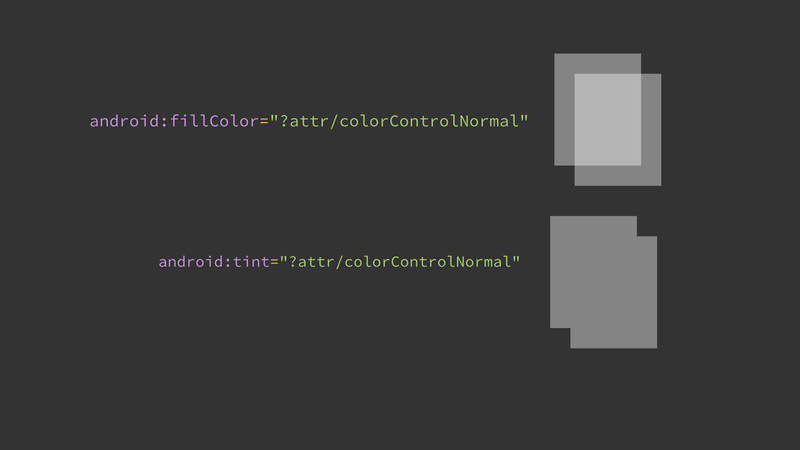 It also enables you to supply different color values in different configurations using Android’s resource qualifiers. For example you could provide alternate color values in night mode (res/colors-night/colors.xml) or if the device supports wide color gamuts (res/colors-widecg/colors.xml). All versions of vectors (back to API14 through AndroidX) support using theme attributes (e.g. ?attr/colorPrimary) to specify colors. These are colors provided by a theme and prove extremely useful for creating flexible assets that you can use in different places in your app. There are 2 main ways to use theme colors. A benefit of using tints is that you aren’t reliant on the source artwork for your assets (usually from your designer) being the correct color. Applying a standard tint like ?attr/colorControlNormal to icons both gets you themeing and guarantees that assets are exactly the same, correct color. The tintMode attribute lets you change the blending mode used to tint the drawable, it supports: add, multiply, screen, src_atop, src_over or src_in; corresponding to the equivalent PorterDuff.Mode. The default src_in is usually what you want and treats the image as an alpha mask applying the single tint color to the entire icon, ignoring any color information in the individual paths (although the alpha channel is maintained). For this reason, if you plan to tint icons then it’s best to use a fully opaque fill/stroke color (convention is to use #fff). You might wonder when to tint the assets and when to use theme colors on individual paths as both can attain similar results? If you want to use theme colors on only some paths, then you have to use them directly. Another consideration can be if your asset has any overlapping rendering. If so then filling with a semi-opaque theme color may not produce the effect you want, but applying a tint may. 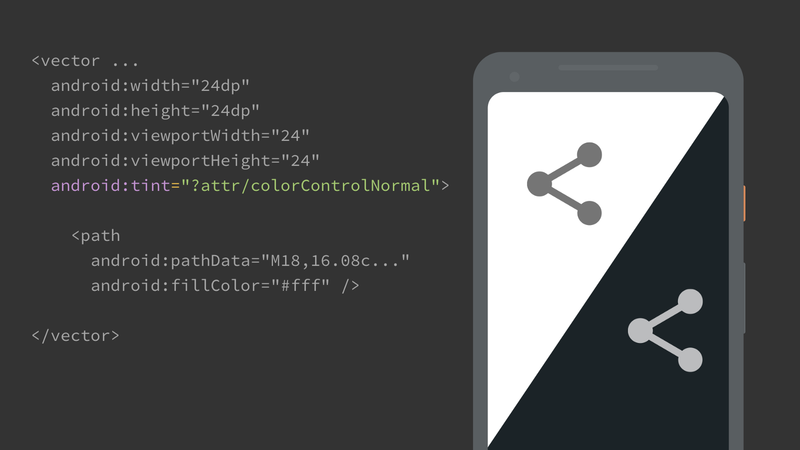 Note that you can vary the theme used to inflate the drawable either at the Activity/View level by setting the android:theme attribute, or in code using a ContextThemeWrapper with a specific theme to inflate the vector. VectorDrawable supports referencing ColorStateLists for fills/strokes. In this way, you can create a single drawable where path(s) change color depending upon the view/drawable’s state (such as pressed, selected, activated etc). This was introduced in API24 but recently added to AndroidX, from version 1.0.0 bringing support back to API14. This also uses the AndroidX ColorStateList inflater which means that you can also use theme attributes and alpha in the ColorStateList itself (which were themselves only added to the platform in API23). While similar results could be achieved using multiple drawables in a StateListDrawable, if the rendering differs little between states this reduces duplication and can be easier to maintain. I’m also a big fan of creating your own states for custom views which can be combined with this support to control elements within an asset e.g. making paths transparent unless a certain state is set. At build time, the gradient is extracted to its own resource and a reference to it is inserted in the parent element. If you’re going to use the same gradient multiple times it’s better to declare it once and reference it as the inline version will create a new resource each time. When specifying gradients, any coordinates are in the viewport space from the root vector element. Let’s take a look at each type of gradient and how to use them. Linear gradients must specify start/end X/Y coordinates and type="linear". 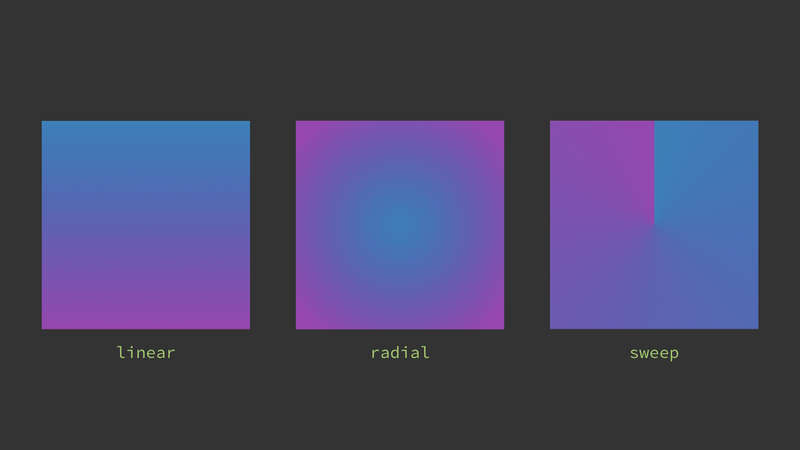 Radial gradients must specify a center X/Y and a radius (again in viewport coordinates) and type="radial". Sweep gradients must specify just a center X/Y and type="sweep". 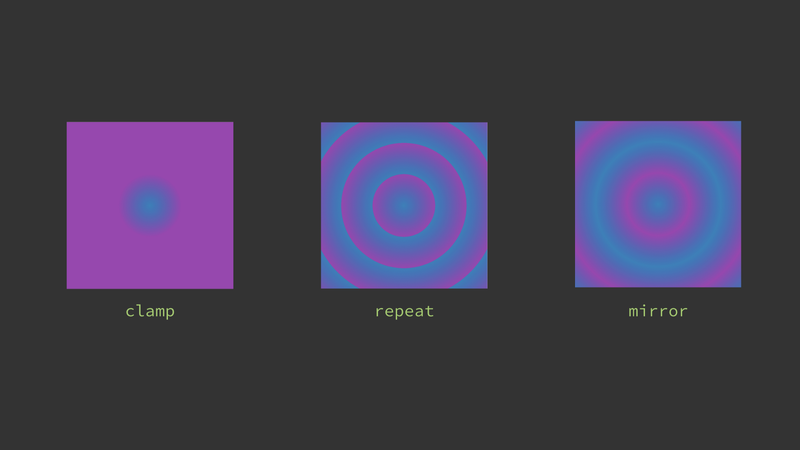 As a convenience gradients let you specify a startColor, centerColor and endColor directly in the gradient. If you need finer grained control or more color stops you can also achieve this by adding child item elements specifying a color and a [0–1] offset (think of this as a percentage of the way through the gradient). Linear and radial (but not sweep) gradients offer a concept of tiling — that is if the gradient doesn’t cover the entirety of the path it’s filling/stroking, what to do. The default is clamp, which just continues the start/end colors. Alternatively you can specify repeat or mirror tile modes which… do as their names imply! In the below examples, a radial gradient is defined over the central blue→purple circle, but fills the larger square path. Note that this technique is a far cry from full SVG Pattern support, but it can be useful. Gradients are extremely common in larger vector artwork like illustrations. Vectors can be a good fit for illustrations but be aware of the memory tradeoffs when inflating them at large sizes. We’ll revisit this later in the series. Hopefully this post has shown that VectorDrawables support a number of advanced features that you can use to render more complex assets in your app or even replace multiple assets with a single file, helping you to build slimmer apps. I’d suggest that all apps should be using theme color tints for icons. ColorStateList and gradient support is more niche, but if you need it, it’s good to know that vectors support those use cases. The compatibility story with vectors is good so these features can be used today in most apps (more on this in the next installment). Thanks to Ben Weiss, Don Turner, and Doris Liu.